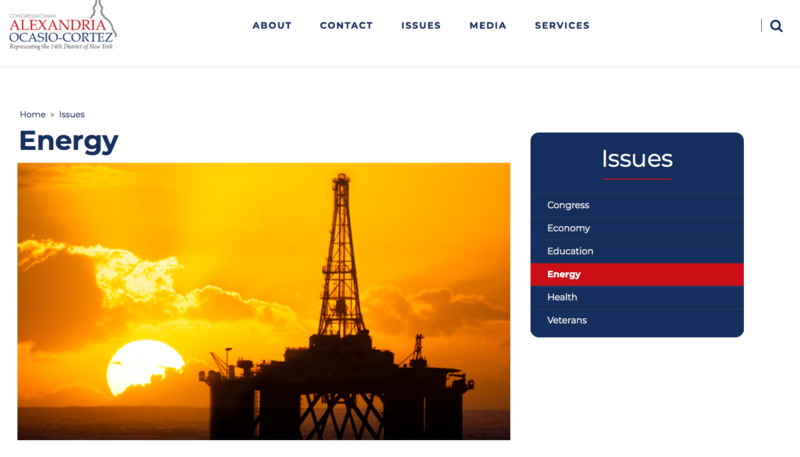 The congressional website belonging to Democratic New York Rep. Alexandria Ocasio-Cortez, a vehement opponent of fossil fuels, prominently features an image of an off-shore drilling rig. Screenshot of Ocasio’s House website. At the time of this article’s publication, the offshore drilling rig picture could still be seen when visiting Ocasio-Cortez’s energy issue section on her congressional website. The image is perplexing given her adamant criticism of the U.S. oil and gas industry and her promotion of the Green New Deal, a proposal to dramatically transition the country’s energy sector away from fossil fuels and toward renewable sources of power. It would seem a picture of a wind turbine or solar panel would be more fitting for her internet page. Ocasio-Cortez, a self-described Democratic socialist, unveiled her Green New Deal on Thursday. The resolution not only calls for a rapid overhaul of the country’s power market, but also sets a number of social justice and welfare goals — proposals that go well beyond climate change. The resolution, which calls for World War II-style mobilization efforts to cut down on the nation’s carbon emissions, also originally sought to tackle cow flatulence, which happens to be a big source of methane emissions. 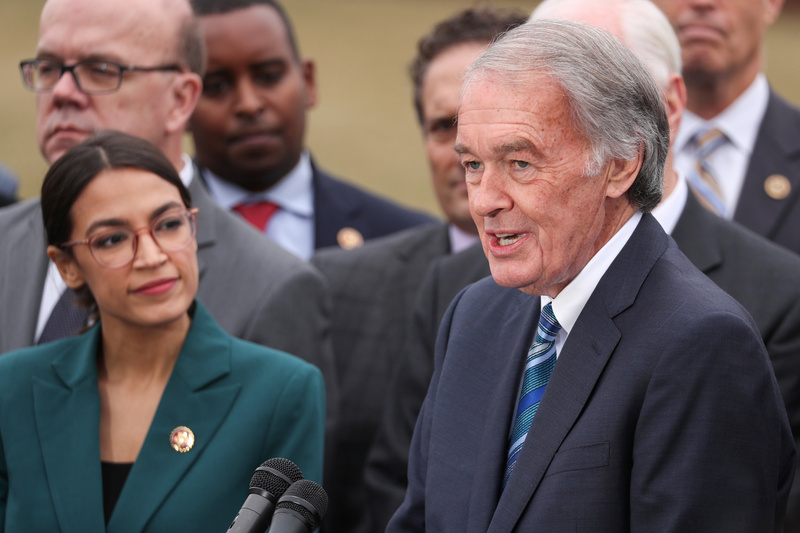 U.S. Representative Alexandria Ocasio-Cortez (D-NY) and Senator Ed Markey (D-MA) hold a news conference for their proposed “Green New Deal” to achieve net-zero greenhouse gas emissions in 10 years, at the U.S. Capitol in Washington, U.S. February 7, 2019. REUTERS/Jonathan Ernst. “We set a goal to get to net-zero, rather than zero emissions, in 10 years because we aren’t sure that we’ll be able to fully get rid of farting cows and airplanes that fast,” an earlier version of the resolution’s fact sheet read. The resolution is not expected to pass Congress. House Speaker Nancy Pelosi herself has suggested the Green New Deal is more of a suggestion rather than a concrete part of the Democratic Party’s legislative agenda. Ocasio-Cortez’s office did not immediately respond to a request for comment.